International’s Pino Men’s Ballroom Shoe is named after World Champion William Pino. The sleek ‘Pino‘ design is a classic style, available online in the combination of Black Nubuck & Black Patent. It is eye-catching and elegant and is perfect for those looking for something a little different. It is possibly the most stylish shoe for men on our shelves at Duo Dance. 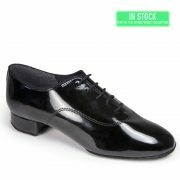 The Pino Men’s Ballroom Shoe is an elegant, full-sole, supportive Dance shoe in a combination finish of black patent and black nubuck. It has a 1″ heel and is available in UK sizes 5.5 – 12. 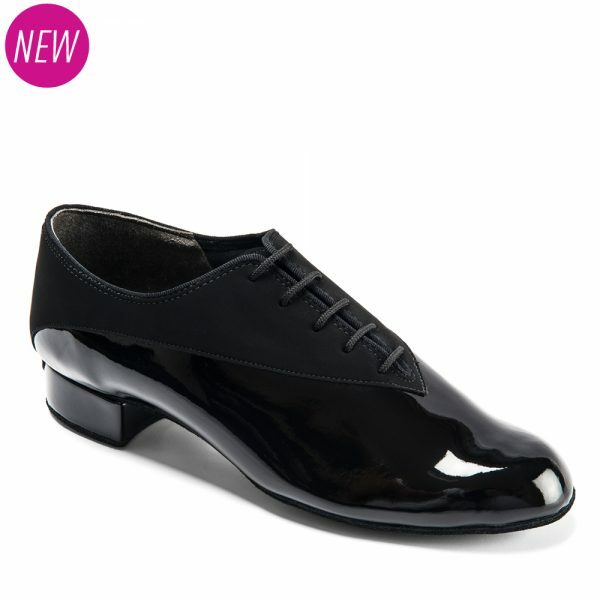 We offer this shoe in a regular fit but as with other International Men’s Ballroom Shoes any width is available. Please just email us at info@duodance.co.uk and we will amend your order. Any “made to order” shoe will take 2-3 weeks to manufacture and International Dance Shoes will not charge you for this service. Suede sole allowing the dancer perfect grip and glide on all dance floors. Worn by: William Pino (World & Italy Professional Ballroom Champion), Emanuel Valeri (World Amateur Ballroom Champion & Denmark Professional Ballroom Champion), Pasquale Farina(Amateur Ballroom Champion), Eugen Miu (Denmark Junior Ballroom Champion).